It doesn’t get any better than this.. 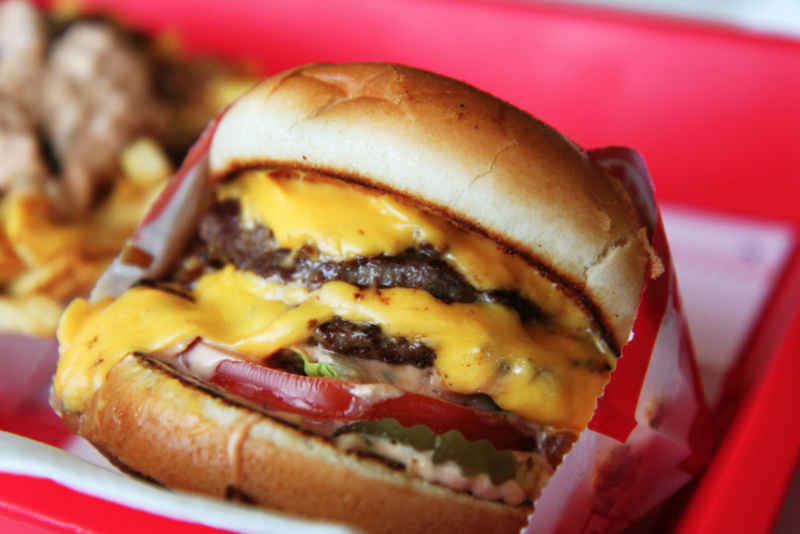 If you want a smashing weekend barbecue or Memorial Day, then you will love this In-N-Out Double Double recipe! There’s nothing like their infamous mouthwatering burgers known for its freshness, special sauce and great taste that keeps people coming back for more! For best results, use the best ingredients. Use ground beef chuck with an 80/20 fat ratio (has the best marbling for superior taste), and thick-sliced cheese (it’s the Double Double, folks) for your own mouthwatering burgers. And don’t worry about having any leftovers. We promise! Fresh, cheesy, savory burgers with a delicious special sauce! So Good! Sauce: In a medium bowl, stir together the mayonnaise, ketchup, mustard, sweet and dill pickle relishes, Worcestershire sauce, vinegar, salt and sugar. Makes about 3/4 cup. Set aside. The sauce can be kept in the refrigerator up to two weeks. Vegetables: Tear lettuce into bun-size pieces, and slice the tomatoes 1/4″ thick, and onions, thinly sliced (you can also quickly grill these if you prefer), and set aside with the cheese and dill pickles. Buns: Preheat oven to 400 degrees. Place closed bun in oven for 2 minutes until slightly darkened and crisped. Heat 1/2 Tsp oil in 12″ non-stick skillet or griddle over medium-high heat until shimmering. Open bun and add face-down to skillet, and toast until dark brown around edges – about 1 minute. Patties: Form ground beef into 16 2-ounce balls. Pound the beef into 1/4″ thick patties (4″ in diameter), season generously with salt and pepper (don’t overdo it). Add 1/2 teaspoon oil to frying pan, swirl to coat, and heat over medium-high heat until lightly smoking. Add burger patties and cook without moving until well browned and crusty on first side, about 2 1/2 minutes. Flip patties with a thin spatula, and cook the remaining side for 1 minute. Top each patty with a slice of cheese. While the patties are cooking, start topping each bottom bun with half of special sauce, 4 slices pickles, 1 slice tomato, lettuce, and remaining special sauce. Transfer patties to the buns to complete your stack with 1 beef patty with cheese on top of the lettuce with special sauce, 1 slice onion, 1 patty with cheese, and lastly, the top bun. Serve immediately. Have extra hamburger buns handy. In case the first batch gets burnt after your first try. Want A Delicious Dessert Recipe? Now Watch How To Make Cookies & Cream Cookies!